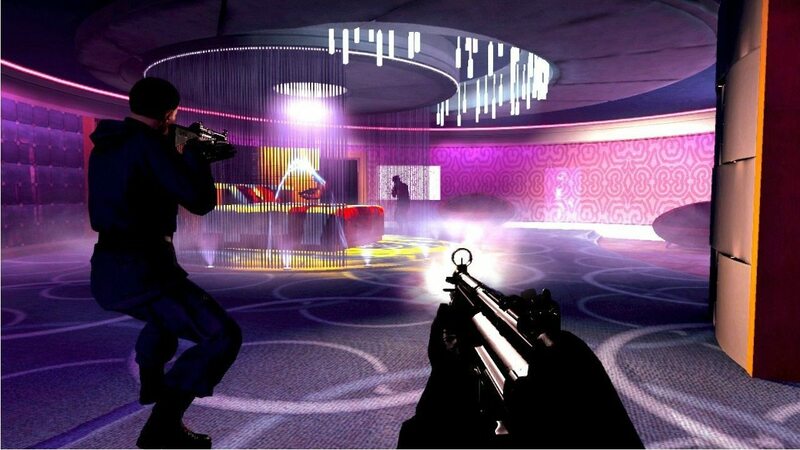 On paper, 007 Legends sounds a likable concept. We begin with the closing section of Skyfall’s pre-gun barrel sequence, Bond fighting Patrice to recover a stolen hard drive whilst atop a moving train. Exiting a tunnel, the embroiled duo fall into the sights of accompanying MI6 agent Eve, who warily looks on through her sniper scope. Explaining that she can’t get a “clean shot” to neutralise Bond’s combatant, M barks at her to “take the bloody shot.” The bullet strikes Bond’s shoulder, sending him tumbling into a river. Concussed from impacting upon the water from such a height, his mind dwells upon previous escapades. With the premise in place, you can prepare to gallivant through key action scenes from Goldfinger, On Her Majesty’s Secret Service, Licence to Kill, Die Another Day, Moonraker and, lastly, Skyfall. Yet in execution, everything just doesn’t align well. What makes the game’s weaknesses ever the more glaring, is that it has been launched directly alongside Call of Duty: Black Ops II. 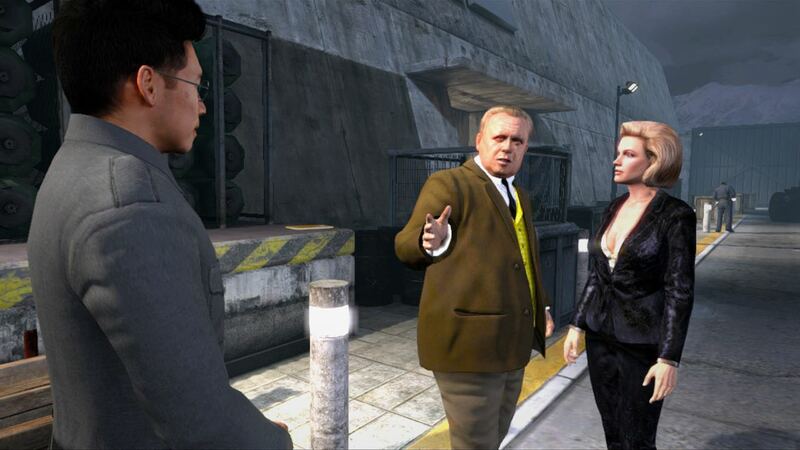 In the shadow of Activision’s staple powerhouse, 007 Legends just doesn’t cut it. 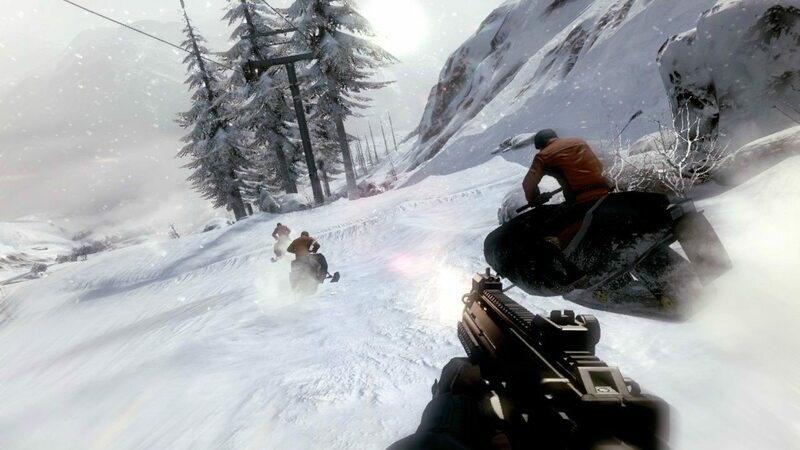 You’ll storm Fort Knox, dodge enemies whilst slalom skiing, infiltrating Sanchez’s facility, traverse Grave’s ice palace, and even have the opportunity to partake in the motorbike chase scene from Skyfall. Yet it is a lifeless, dejected experience that never becomes enthralling, levels loosely pivoting around the scenes they derive from. Not even the rousing iconic Bond theme can do enough to motivate your enthusiasm. Hand-to-hand combat becomes prominent, with players able to slickly subdue enemies with a mere click of the right thumbstick. Yet key moments, such as your struggle with Oddjob take a different spin, seeing QTEs that require you to respond correctly by flicking each thumbstick either up or down. Whilst their cinematic nature proves a highlight early on, these soon become progressively unremarkable with the mechanic soon becoming overused. Oddjob, Blofeld, Sanchez, Zao, Graves, Jaws… it’s used every time. The game’s general AI is hit and miss, with enemies aimlessly wandering away from the safety of cover or straight into the radius of grenades. Friendly AI similarly suffers, with characters mindlessly running into scenery, being useless in firefights and simply not following you, forcing you to reload checkpoints. An experience-point system akin to that seen within recent Call of Duty entries grants the opportunity to unlock weapon attachments and upgrades, allowing customisation over the arsenal available to Bond. Implementation of the Wii U GamePad is lamentable, granting the option to switch weapons, equip darts or access gadgets with a simple touch of their icon. Which becomes entirely redundant when you realise that such functions can be expedited through using the button layout instead. Whilst some gadgets see attempts to make inventive use of the GamePad’s screen, these prove laborious and cumbersome in design. The objective-based MI6 Ops mode will occupy you beyond completion, which are enjoyable despite the game’s continual generic design that fails to surprise. Your best times are uploaded to online leaderboards, so those looking for a competitive edge will certainly find it here. Surprisingly, online multiplayer is relatively active with little effort required to find yourself in a lobby alongside other Wii U owners. The experience is dampened once you’re within matches, however, with lag prevailing. Whether this can be blamed on Activision’s servers or the Nintendo Network itself is unclear, but it’s a shame that such issues are hampering the game. “James Bond Will Return” we’re promised, yet we’ll need some time to recover from this travesty of a game.